A century after his death on 25 March 1918, many harmonia mundi artists are eager to pay tribute to Claude Debussy, the magician of melody and timbre, the great 'colourist' and father of modern music. Alexander Melnikov is among those pianists increasingly committed to playing the works of the past on the instruments on which they came into being (or could have done so). 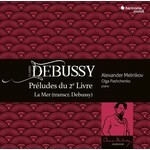 And so it is on a 'period' piano (an Érard piano ) that he breathes new life into Book II of the Préludes, but also - with the help of Olga Pashchenko - the extraordinary transcription of La Mer by the composer himself. 3 III. (… La Puerta del vino). Mouvement de "Habanera"